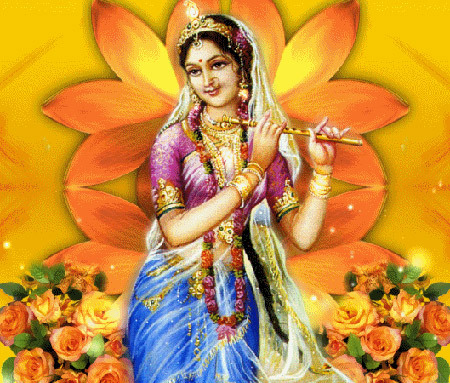 Radha, the mother of beauty, consort of Lord Krishna and forever an example of true, boundless and eternal love. This article will have all the information related to Radharani, her birth, her love for Lord Krishna and how this festival is celebrated beautifully all over India. This year Radha Ashtami is on the 13th of September, 15 days after Krishna Janmashtami. Radha Ashtami is celebrated in the Bhadrapada month on the Ashtami of Shukla Paksha. This is a grand event in Gahavar forest in Barsana, suburb of Mathura. Also in places like Braj, Vrindavan and Rawal the celebrations are just as grand as Janmashtami. Special pujas and rituals are performed on this day. Women observe fast to get the blessings of Radharani. Temples decorate the idols of Krishna and Radha most beautifully, devotees line up to get a glimpse of this marvel. Goddess Radha was born to Vrishbhanu and Kirti. One legend says that Radha was the daughter of King Vrishbhanu, who found Radha as a baby when he was cleaning the floor for a yagna puja. While another legend says that, when Lord Vishnu was to take birth on earth as Lord Krishna, he asked his family to also take birth on earth. Hence Goddess Radha appeared on earth as eternal companion or lover to Lord Krishna. It is believed that Radha was older to Lord Krishna and that her eyes were closed until krishna appeared in front of her. So great is her love for Krishna. According to Skanda Purana there were about 16000 Gopis, of which 108 were the prominent ones. Out of the 108, 8 Gopis were the Principal ones and Radha the most important one of all. The names of the Gopis are Lalita, Visakha, Champakalata, Citra, Tungavidya, Indulekha, Rangadevi and Sudevi. It is believed that Goddess Radha’s love for Krishna was beyond anything mortal, her love for Krishna was immeasurable. Radha and Krishna were one and the same. This quality of hers has been proved in many legends, one of which is given below. To test the love of Radha for Krishna, his wives played a prank on her by giving her a hot glass of milk to drink. On hearing that the milk was sent by Krishna Radha drank it at once. The wives were astounded to see that Radha was perfectly fine even after drinking a boiling glass of milk. Their slight disappointed turned into tragedy when they saw Krishna suffering from ulcer in his throat as a result of the hot milk that radha drank. This incident proved everyone that Radha and Krishna are one and the same. So great was Radha’s love to Krishna that she drank the boiling milk and so great was Krishna’s love to Radha that he never will he let any pain touch her. The celebrations reach its peak in Rawal, the birthplace of Goddess Radha. The idol is bathed, decorated with new clothes and rare jewels. Large amount of milk, coconut, ghee and honey is used for the puja ceremonies which is later distributed to the devotees as prasad. Places like Vrindavan, Mathura and Braj have equally grand celebrations like the one in Rawal. May this festival bring you all the happiness and prosperity, and may you be showered with the blessings of Goddess Radharani.